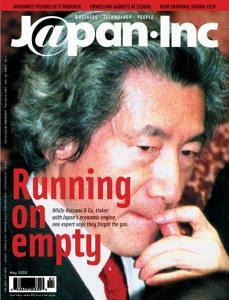 On the cover: While Koizumi & Co. tinker with Japan's economic engine one expert says they forgot the gas. How about a new home security system? Digital Eve's Japan chapter on the struggle to get the nation's women on a technological even footing with its men. A professional musician gets to grisps with a newfangled MP3 player/recorder. Tim Berners-Lee, who single-handedly invented the World Wide Web, was in town to receive JPY 50 million Japan Award. Attacks on pupils and teachers mean Japan's schools, once renowned for their open-door policies, are bringing in Big Brother-style surveillance systems. The best of J@pan Inc's newsletters: Gadget Watch, Wireless Watch and Music Media Watch. Okinawa, Japan's southernmost prefecture, is a semitropical island chain that's best known for being US territory until 1972. That perception is about to change as local and central governments offer incentives to lure high-tech companies to set up shop there. OKINAWA, Japan's southernmost province, is home to some of the country's most successful call centers. Gregory Clark, the president of Tama University, says prime minister Junichiro Koizumi spends too much time tinkering with supply when it's demand that is the problem. Digital technology is rapidly replacing traditional film in the movies -- a move that has serious implications for both the nature of film production and its financing. The high-end server market is going through a transitional period, but who are the winners and losers? Carl Glaeser, CEO of Bowne Global Solutions, talks about globalization, a bankruptcy auction and the future of human translators. How much you can earn if incarcerated in Japan, female schacho and death by overwork.